Copyright © 2015 Smart Graphics. 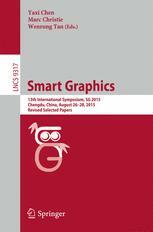 The International Symposium on Smart Graphics will bring together researchers from Computer Graphics, Visualization, Art & Graphics Design, Cognitive Psychology and Artificial Intelligence, all working on different aspects of computer-generated graphics and the user experiences they enable. This year's meeting will be held in Chengdu, China. Advances in computer graphics have made visual media the heart of the user interface, and it is clear that graphics will play a dominant role in knowledge work, entertainment, and the home. Indeed, as computers become more and more pervasive, and display sizes both increase and decrease, new and challenging problems arise for the effective use and generation of computer graphics. Smart Graphics is grounded in a deep understanding of human abilities, activities, and desires. This understanding arises through the integration of fields such as art, design, and the social, cognitive, and perceptual sciences. Insights are realized in the form of novel methods for producing and interacting with rich graphical displays often utilizing established techniques from Computer Graphics, Artificial Intelligence, and Computer Science in general. SG15 welcomes submissions from computer graphics, HCI & AI researchers and practitioners, applied philosophers, cognitive scientists, artists and graphic designers. Chengdu, the capital city of Sichuan Province, is located in the southwestern China. 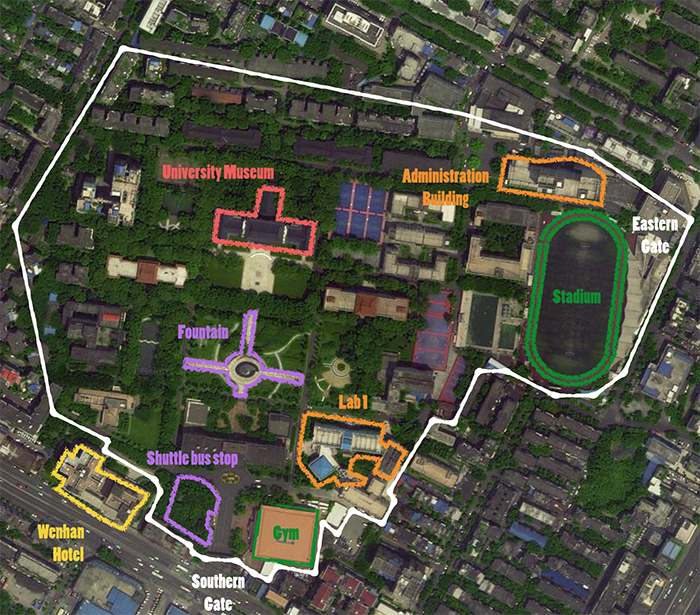 Covering a total area of 12,4000 square kilometers, Chengdu is consisted of 9 districts, 4 cities and 6 counties. The population of Chengdu has reached over 10 millions. The city bears a humid subtropical climate with its average annual temperature around 15℃. Chengdu has a long history over 2500 years. It is also a city of universities as 14 colleges and universities are situated here. More information . SG’15 will be held at Southwest University for Nationalities (SWUN Wuhou campus). The shuangliu international airport (CTU) is located in the Shuangliu county. Taxi is the easiest transportation from CTU to SWUN Wuhou campus. The fare is about 60 RMB and takes around 30 minutes to get to downtown Chengdu. You may also take airport shuttle bus to go to Minshan hotel. From there you can take taxi or buses to SWUN or your hotel. Here to see more information . As one of the most popular tourism cities in China, Chengdu enjoys rich cultural heritages and beautiful scenic sights. Kuan and Zhai Alley (宽窄巷子) / Jin Li (锦里): traditional architectures, Sichuan Opera, tea houses. Chengdu Research Base of Giant Panda Breeding (大熊猫繁育研究基地): well-known institution for the preservation of endangered wildlife, integrating scientific research and breeding of giant pandas, conservation education, tourism education, and panda cultural events. Museums: Sichuan Meseum (四川博物院), Jinsha Site Museum (金沙遗址博物馆), Sanxingdui Museum (三星堆博物馆). Emei Mountain (峨眉山) and Leshan Giant Buddha (乐山大佛): included in the UNESCO World Natural and Cultural Heritage, Emei Mountain is known as one of the China’s four major Buddhist mountains, and the Giant Buddha is the biggest seated maitreya in the world. Dujiangyan (都江堰) and Qingcheng Mountain(青城山): Dujiangyan is a water control and irrigation dam that was build more than 2000 years ago and is still in function nowadays. Located 10 kilometers away from Dujiangyan, Qingcheng Mountain was one of the birthplaces of Chinese Taoism. Jiuzhaigou National Park(九寨沟): known for its multi-level waterfalls and colorful lakes, and was declared a UNESCO World Natural Heritage Site in 1992. Chengdu cuisine includes various snacks which are called “xiaochi” in Chinese. Due to the humidity here, the predominant ingredient is chili and the most representative food is Hotpot, basically a big pot of boiling oil, water and spices. Patrons choose from a big variety of food and boil them in the pot. Besides hotpot, there are other famous Sichuan dishes such as Kongpao checken (宫保鸡丁), spiced doufu with chili (麻婆豆腐), two-time cooked pork (回锅肉) and fish-flavored pork slices (鱼香肉丝), etc..
Dr. Xiang Cao is the founder and CEO of Xiaoxiaoniu Creative Technologies. It aims to provide playful experiences and technologies for everyone , especially children, unleashing their full imagination in the context of entertainment and education. Before founding Xiaoxiaoniu, Dr. Cao worked for many years in industrial research labs. He has been a director and senior research staff member at Lenovo Research & Technology. Prior to that, he was a researcher at Microsoft Research Cambridge, and later in its Beijing lab. He has also worked and interned at Siemens, IBM, and Intel, as well as being a fellow at Corpus Christi College in the University of Cambridge. Dr. Cao's research work spanned several areas in HCI, most notably novel interaction technologies & devices and digital tools to support creativity, and also computer-supported cooperative activities and user performance modeling. He received his PhD at University of Toronto, supervised by Prof. Ravin Balakrishnan. Among other professional services (e.g. program committees for ACM CHI 2011~2015, ACM UIST 2012 and 2015, ACM UbiComp 2014, editorial board of Springer HCI book series), he serves as the vice chair of the China Chapter of ACM Special Interest Group on Computer Human Interaction (SIGCHI), working towards promoting HCI research in China and its connection with the international HCI community. Shigeo Takahashi is currently a professor in the School of Computer Science and Engineering at the University of Aizu, Japan. He received his B.S., M.S., and Ph.D. in computer science from the University of Tokyo in 1992, 1994, and 1997, respectively. His research interests include scientific and information visualization, visual perception modeling, geographical information systems, and geometric modeling. He served as an associate editor of IEEE Transactions on Visualization and Computer Graphics (2011-2014), served and is serving as a program co-chair of IEEE Pacific Visualization Symposium (2014, 2015) and International Symposium on Visual Information Communication and Interaction (2015). He also served as a program committee member for more than 50 computer visualization and graphics conferences. He received the Most Cited Paper Award for Graphical Models (2004-2006) from Elsevier. Smart Graphics 2015 welcomes submissions from researchers and practitioners, as well as graphic artists and graphic designers interested in an interdisciplinary approach to the design of smart interactive visual, auditory, and haptic displays. We specially encourage young researchers to submit their ideas and results. Special prizes will be awarded to the best paper and the best students paper. In 2015, we propose a specific emphasis on the integration of scientific research into the design of intelligent, interactive, and context-aware digital media applications. In particular, we encourage discussion of research that pertains to interactions within the everyday world, using smart graphics and responsive media to enrich and augment experiences, culture, leisure, and work. These will encompass comprehensive descriptions of original work within the scope of the symposium (limited to 12 pages in Springer LNCS format). Some of the submitted research papers may be accepted as a short paper, which is limited to 8 pages in the Springer LNCS format. Tentative or preliminary results of research or design work with emphasis on the interdisciplinary evaluation of the ideas (limited to 4 pages in Springer LNCS format). Poster papers will be included in the proceedings. Short descriptions of research or design work that the authors intend to show and discuss in a demo session at the symposium (limited to 2 pages in Springer LNCS format). System demonstration papers will be included in the proceedings. Computer animations, multimedia performances, interactive art and design, etc. Artists must submit a three page proposal outlining the concept and technique of their work, including a discussion of the relationship between smart technologies and their artistic and creative practice. An international jury of renowned scientists and artists will select the submissions. Selected works will be displayed during the Smart Graphics symposium, and presented to the public via an evening of performance, installation, and gallery exhibition at the symposium venue. A report of the arts track including all the selected works will be included in the proceedings. Smart Graphics 2015 submissions are handled via EasyChair. Please submit your paper to https://easychair.org/conferences/?conf=sg2015 . Supplementary files such as video or audio can be sent to smartgraphics2015@hotmail.com . We offer two different ways of registration for international and participants from China mainland respectively. For international participants: Registration can be done via PayPal . The authors of each accepted paper will receive a transfer instruction email from us. If you don’t receive the email, please consult us. Note: Since we receive ONLY US dollars please make sure you choose USD in PayPal transfer page. With a successful PayPal transfer, please email us (smartgraphics2015@hotmail.com ) the registration form 1 (renamed as Registration-form1-[paper-number]-[name]). Please bring a printout of your Paypal Receipt to the symposium, in case any unclarities arise. Domestic participants are required to make a bank transfer to the following account and email us (smartgraphics2015@hotmail.com ) the rregistration form 2 ( (renamed as Registration-form2-[paper-number]-[name]). Please refer to the link for visa information. If you need a formal invitation letter for visa application, please make sure that you fill out the relevant information in the registration form 1. If you need us book the Wenhan Hotel for you, please fill out the relevant information in the registration form. Wenhan Hotel: on-campus hotel, Rate: 300RMB/room/night (breakfast not included in this rate but can be booked at the hotel restaurant after your arrival). SG ’15 is organized, sponsored, and hosted by Southwest University for Nationalities. The Symposium is held in cooperation with the Association for the Advancement of Artificial Intelligence (AAAI). Now, SG ‘15 has been approved for in-cooperation with SIGAI, SIGCHI, and SIGGRAPH.